Look at my lovely colorful dinner! Roasted veggies. The cool pink and white stripes are chioggia beets. If you roast them whole, they maintain their wonderful stripes inside. If you cut them before cooking, they lose their stripes. 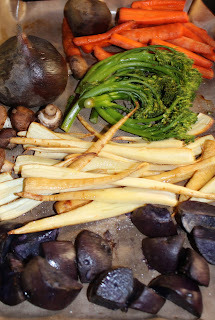 Along with the beets are carrots, broccolini, mushrooms, roast parsnips (can't get enough of those) and then at the front of the picture are wonderful purple potatoes! Nearly a rainbow of food in one meal. Do you eat a rainbow a day? See the PCRM chart below which shows the cancer-fighting and immune boosting power of different colored foods. The more naturally colorful your meal is, the more likely it is to have an abundance of carotenoids as well as other health nutrients. Carotenoids are the pigments that give fruits and vegetables, such as carrots, sweet potatoes, and tomatoes, their bright colors. Beta-carotene, lycopene and lutein are all different varieties of carotenoids that act as antioxidants with strong anti-cancer properties.